Last month, the Mayor’s Office released a report ranking itself on how it achieved, or didn’t achieve, its stated transportation goals over the last seven and a half years. Rather than traditional grades, the report gave the offices green (for “completed”), yellow (for “in the works”) or red (for “didn’t/won’t happen) on a variety of transportation issues. Download the full report by clicking on the image. As speculation on whether the “Subway Mayor” is going to move on to Washington, D.C. to be the next Secretary of Transportation intensifies, this report could be a resume of sorts for the Mayor. If the rumored appointment does happen, a report released to the yawn of the local press corps could become fodder for national debate. While the report does have many more green dots than yellow or red, after all what politician releases a report that shows staff underperforming, there is enough red and yellow to give the report an honest look. And after all, transportation is one of the areas where Villaraigosa and his team excel. To nobody’s surprise, the Mayor’s Office gives itself high marks on transit expansion, noting the passage of Measure R in 2008 and the less-exciting but perhaps just-as-important Proposition B in 2006. Both the County and State transportation taxes have allowed Metro to make major investments in transit expansion projects. In addition to the tax passages, the report lists a handful of projects completed in recent years: The Gold Line Eastside Extension, the first Phase of the Expo Line, the Orange Line Chatsworth Extension, and even the opening of the original Orange Line. During his campaigns, Villaraigosa ran on doubling the rapid transit and rail system. As the chart below shows, Los Angeles County is well on the way to reaching that goal thanks in large part to Villaraigosa’s leadership. While Villaraigosa has talked about the importance of maintaing low fares and having an expanded bus network, neither issue is mentioned in the report. As the Bus Riders Union and their allies have noted, despite the transit taxes, bus ridership has shrunk during the Mayor’s term, even if the trend seems to have reversed itself in the last two years. Another area where the Mayor’s Office gave itself good marks was with the city’s success lobbying for federal transportation dollars. The report notes the success the city enjoyed lobbying for $130 million of American Reinvestment and Recovery Act Funds (aka 2009 Stimulus Funds) and the mixed success of the America Fast Forward nee 30/10 Plan. America Fast Forward was a plan put forward by the Mayor’s Office and Move L.A. that would encouraged a change in the federal funding formulas to benefit areas that are taxing themselves to pay for new projects. “We’re not asking for a gift, we’re asking for a loan,” was a popular phrase used to explain the plan. Expands funding for TIFIA to $750 million in FY 2013 and $1 billion in FY 2014. Authorizes US DOT to make upfront conditional commitments to projects through Master Credit Agreements making TIFIA assistance more predictable for larger, multi‐year phased capital programs. Authorizes US DOT to allow limited interest rate buydowns. Provides $105 billion (roughly $54 billion per year) for the nation’s surface transportation programs. However, a federal bond program known as QTIB, which reformers and Villaraigosa hopes would be expanded, was actually not included in the final Federal Transportation Bill. This program was seen as a lynch pin for AFF. While the city did see some large victories in the transit funding arena, it has tradtionally fallen short when applying for state and federal “Safe Routes to Schools” funds, one of the largest available pots of transportation funding for bicycle and pedestrian safety improvements. The recent hiring of two “pedestrian coordinators” at LADOT may reverse this trend. Conversely, the Mayor’s office showed leadership in pushing for a bicycle and pedestrian set-aside in the city’s portion of the Measure R dollars. This set-aside is responsible for not just the hiring of the new coordinators, but many of the bicycle projects that have dramatically improved the Mayor’s standing with cyclists. Speaking of bicycle and pedestrian improvements, the report is all smiles. For bicycling improvements, it’s easy to see why. The report highlights the coming bike share program with Bike Nation, the innovative Bike Friendly Street on Yucca in Hollywood, and two years of success implementing the 2010 Bicycle Plan. This is sort of a funny graph. In 2011, advocates were told the first year of the 2010 Bike Plan was the start of the 2012 fiscal year, July 1, 2011 when they complained that the plan wasn't being implemented. Looks like we're back to the January 1, 2011 as the start date for the plan (which was signed into law in March of 2011). 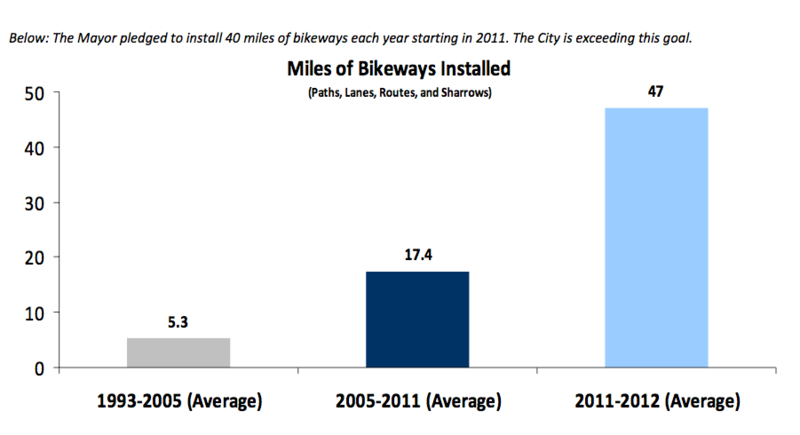 Regardless, the chart does tell the story of a city that is dramatically increasing its investment in bicycle infrastructure. Bully for them. For pedestrian improvements, the record is not as clear. The report highlights the addition of new pedestrian oriented staff and the Sunset Triangle Pocket Park, but somehow completely misses the ongoing crisis of Los Angeles’ sidewalk conditions. Officials estimate the cost of repair at $1.5 billion and there is no obvious source of funds to make these fixes. For watchers of the Mayor’s Office or transportation policy junkees, there is a lot to digest in the report. For example, there’s an entire section on Metrolink and High Speed Rail not examined in this article. If you discover anything noteworthy while paging through, be sure to let us know in the comments section. Ugh! Sharrows are not Bikeways!!!!! I give a F for the SLOWWWWWWWWWW Expo Line and the malfunctioning Washington St. Junction.